Become a Maths Calendar Savant! Giving students an insight into mathematical savants and other mathematical geniuses is a good way of invoking a sense of wonder about the subject. Calendar savants are able to correctly name the day of the week from any given date in history – almost instantly. Whilst it is still not clear how they do this, it is possible to achieve the same feat using a relatively straightforward algorithm. To make things easier, limit the prediction to the first decade of the 21st century. Step 1 – Memorise (or discreetly write it on the board somewhere) a twelve digit number: 622 – 503 – 514 – 624. Each digit corresponds to a month of the year. January is 6, February is 2, March is 2 etc etc. Step 2 – Learn to work in mod 7. In mod 7 we just look at the remainder when dividing by 7. 36 divided by 7 is 5 remainder 1. So 36 is 1 (mod 7). 23 divided by 7 is 3 remainder 2. So 24 is 2 (mod 7). A number like 14 would be 0 (mod 7). Now we’re ready to start the calculation. This particular method will calculate the day of the week for any date in the 21st century (it can be slightly adapted to calculate dates in previous centuries). The date for our example will be March 10 2004. Step 1 – work out the day of the month mod 7. In this case 10 is 3 mod 7. Step 2 – add the month value. The month value (from the preparation step) is 2. Therefore 3 + 2 = 5. Step 3 – count how many years since 2000. This is 4 years in our example. Add the 4 to the 5 from the last step = 9. This is 2 (mod 7). Step 4 – adjust for leap years. 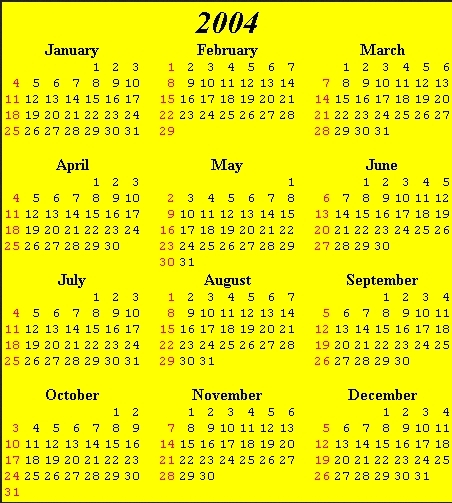 There was a leap year in 2000, then in 2004, then 2008 etc. So in our example there had occurred 2 leap years (if our date was before March 1st then we wouldn’t count the 2004 leap year). Add this 2 onto the previous answer. 2 + 2 = 4. You can check the calendars for the 21st century here. Learning objectives: This is a nice little activity that can be used either as a starter or as part of a larger lesson on mental arithmetic, or as part of a lesson looking at mathematical savants and other mathematical geniuses throughout history. The lesson resources are uploaded on TES here. Watch video on autistic savants. Discuss about can this be possible? Highlight links between savant ability, high functioning autism mathematical geniuses. Demonstration! Have a student choose any date from 1st January 01 2000 to 31st December 2009. Give all students a copy of the calendar sheets. Following the rules below correctly give the day of the week for that date. Try it one more time. Discuss that this was done using an algorithm – a set of instructions to follow. And that students can also learn to do this. Hand out the sheet “How to Calculate like a Mathematical Savant.” Go through the rules – then let the students practice in pairs. Can they get it correct?